﻿ Off-grid surge protection - Fatech Electronic CO., LTD.
Fatech Electronic (CHINA) LTD develops dc surge arresters, which are used for protection of photovoltaic off grid systems, 1 pole and 2 poles are available. They are with remote control contacts and inspection window. Welcome your inquiry, customized dc surge arresters are acceptable. MOV based. DC surge arrestors for protection of photovoltaic system. For PV system voltage 150Vdc.2 poles, Imax=40kA(8/20us), In 20kA(8/20us). Up≤0.8kV.With remote control contacts & inspection window. DC surge arresters for protection of photovoltaic system. For PV system voltage 96Vdc. 2 poles, Imax=40kA(8/20us), In 20kA(8/20us). Up≤0.8kV. Without remote control contacts & inspection window. MOV based. DC surge protector for protection of photovoltaic system. For PV system voltage 48dc. 2 poles, Imax=40kA(8/20us), In 20kA(8/20us). Up≤0.6kV.With remote control contacts & inspection window. MOV based. PV surge protectors for protection of photovoltaic system. For PV system voltage 48Vdc.Imax=40kA(8/20us), In 20kA(8/20us). Up≤0.8kV. With remote control contacts & inspection window. MOV based. 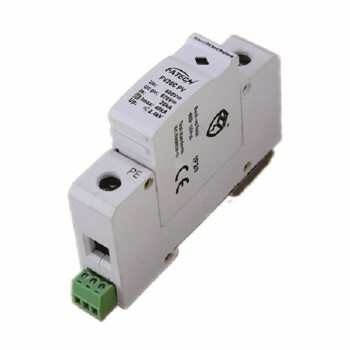 DC surge protectors for protection of photovoltaic system. For PV system voltage 48Vdc.Imax=40kA(8/20us), In 20kA(8/20us). Up≤0.6kV.With remote control contacts & inspection window. MOV based. DC surge protector for protection of off-grid photovoltaic system. For PV system voltage less than 100Vdc. 2 poles, Imax=20kA(8/20us), In 10kA(8/20us). Up≤0.6kV.With remote control contacts & inspection window. MOV based. DC surge arresters for protection of photovoltaic system. For PV system voltage 48dc.2 poles, Imax=20kA(8/20us), In 10kA(8/20us). Up≤0.3kV.With remote control contacts & inspection window. MOV based. DC surge protective devices for protection of photovoltaic system. For PV system voltage 96Vdc. Imax=20kA(8/20us), In 10kA(8/20us). Up≤0.6kV. With remote control contacts & inspection window. MOV based. 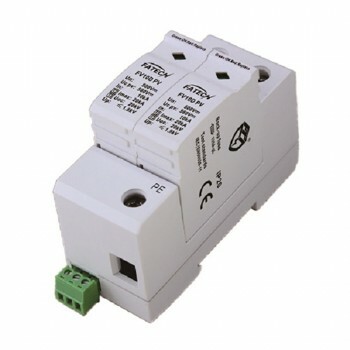 DC surge protective devices for protection of photovoltaic system. For PV system voltage 48Vdc. Imax=20kA(8/20us), In 10kA(8/20us). Up≤0.3kV. With remote control contacts & inspection window. MOV based. DC surge arresters for protection of photovoltaic system. For PV system voltage 100Vdc.2 poles, Imax=10kA(8/20us), In 5kA(8/20us). Up≤0.6kV.With remote control contacts & inspection window.